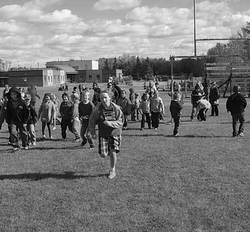 This year, Falun School had our 19th annual Terry Fox Run in memory of this great Canadian. We had a line-up of activities, but we started it simple with a delightful pancake breakfast that students, staff and parents could enjoy. Next, there was a huge assembly in which we announced 11 exciting new clubs that will be held at noon recesses. We also enjoyed class performances from every grade to introduce their team spirit name. Our plan was to eat lunch outside, but the weather was too cold, so we had our picnic lunch inside. After that, the excitement began! Our Grade Six students became the captains of twelve teams. The remaining students from K-5 were divided up evenly among them. Teams started activities with “Get to Know You BINGO”. Next up, the teams performed individually crafted warm-ups consisting of: jumping jacks, burpies, Mario jumps, crab walk and duck-duck-goose, etc. After that, we had the run… or three-legged race! The team discussed who would run and who would do the three-legged race. The runners would run around the goal posts 3 times and the three-legged racers would do their race in between the posts. Then, Meals by Moms, supplied us with a refreshing treat…oranges! After all the festivities, we counted our pledges and the grand total was…$ 4009.90!!! That total when added to our previous eighteen fundraising years, makes more than $50,000 that our school has donated to The Terry Fox Foundation. WOW! Since the grade one class raised the most money with $1085.45, they got to choose Mr. Holtby’s hair colour. They decided on pink. We asked Mr. Holtby his thoughts on pink. He said, “I think it’s very appropriate because pink is associated with so many cancer fundraisers.” Students of Falun School think that he is a good role-model, not to mention a very good sport!